If you read some of the coverage of Mercer’s 2010 Quality of Living Survey you would think that Boston did badly. The truth is that it is one of only 4 US cities that appeared in the top 50. All of the other cities were were outside the US. The results are based on a survey of 221 cities versus 215 from last year’s survey. Boston ranked 37 and has held that ranking range since at least 2008. The US has historically not had a huge showing on this list. European cities like Vienna and Zurich tend to dominate the list. In the Americas Canadian cities also outrank the US cities with Vancouver, Ottawa, Toronto, Montreal and Calgary ahead of us. Mercer conducts the ranking to help governments and multi-national companies compensate employees fairly when placing them on international assignments. The rankings are based on a point-scoring index, which sees Vienna score 108.6 and Baghdad 14.7. Cities are ranked against New York as the base city, with an index score of 100. Last year 9 US cities were in the top 50 while only 4 made it to the list this year. Besides Boston, Honolulu, San Francisco and New York City remained on the list. Though Boston’s steady appearance in the top 50 is a good sign we can always do better. It would be interesting to see the details of the survey as well as what demographic categorization was used for Boston. Is it just Boston or does it include Metro Boston which brings Cambridge into the picture? The Boston-Cambridge combination definitely is more appealing. If you really think about it we are on list because there is a demand for expatriates here as well as a supply of workers from multinationals that want to work here. 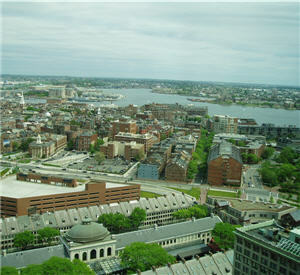 Boston also ranked on the Eco-City Survey at 25 and was one of only seven US cities on that list. Holding our own in the last 2 years is actually an achievement.